Welcome to our brand new 3 room condo located in one of the safest zones in Mexico City. 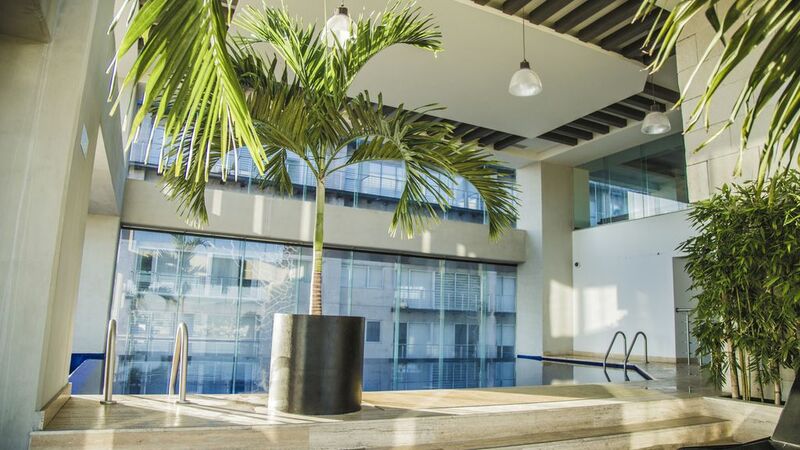 Located in the heart of Mexico City, you will be 10 mins away from Coyoacan or 15 from Roma / Condesa zone, 20 mins away from downtown and 25 mins from Mexico City Intl Airport. The complex counts with awesome amenities for your leisure, such as heated semi olympic pool, sky panoramic pool on the 20th floor, indoor and outdoor cinema, bowling, arcade zone, gym, teen´s lounge, soccer court, sky lounge, business center, sky garden, english lounge, spinning room, kids club and a barbecue zone on the roof. We love to travel and to be hosts for others, feel free to ask for the best options in town. You can find parks, malls and a quiet area to rest. I love to travel, read and swim; chess player, contemporary art fan, attorney, LLM student. The amenities are awesome, you wont find anything as this in Mexico City. The complex has ramps and elevators. We also have cinema, bowling, arcade, 3 pools, soccer court and other incredible amenities. Fabulous condo in Mexico City! Right from our arrival Hamlet and his brother were very helpful and accommodating! They stored our luggage when we arrived early and answered any questions we had during our stay. The apartment was beautiful, with great amenities - pool, bowling, snack shack! Six people had plenty of room to cook, eat, relax and sleep. The location was great - near a store and the metro. We would definitely recommend this condo! We had a really nice stay here with my family! I felt really safe in the building as they had security and you needed a card to enter and get in the elevators. There were lots of amenities (snack bar, arcade(free), bowling, gym etc). There was a big supermarket just two blocks away and a really cute wing place around the corner. The apartment itself was clean and cozy. The only thing we had an issue with was the toilet in the bathroom in the bedroom where I stayed, it wasn't flushing but there is a second bathroom so that was ok, we only stayed for two days, I'm, sure it would have been fixed if we stayed longer. The owner was very quick in his replies to anything I needed! Excellent place to stay for family vacation! We had our family vacation here. We have three active boys and all the amenities provided by the unit were perfect to keep them active whenever we were not site seeing. This neighborhood is quite pieceful and safe. Many people walking their pets throughout all times of the day. Plenty of places to eat within a three block radius including a huge grocery store. The unit was clean and modern fitted with washer/dryer and extremely clean. Two thumbs up and highly recommend this place. We really enjoy staying here. Very nice apartment with a lot of amenities, including a great gym, pool, and business center. Centrally located to great restaurants . Hamlet, the host, was great at staying in touch and answering any questions. Property and it's amenities are fantastic. Building is super secure with security 24/7. Hamlet was very quick to respond to all inquiries. Definitely recommend this unit. You will have no regrets. Thanks, Hamlet for the pleasant experience! Beautiful property. Fun and Safe. I really liked it here. Everything was new and modern and just lovely. Hamlet couldn't have been a nicer, more communicative host leading up to our stay. I highly recommend.